Being a parent comes with many sacrifices: loss of sleep, privacy, alone time, and the ability to leave home without packing like you’re going on vacation. Fortunately, however, with the UPPAbaby Cruz stroller, you don’t have to give anything up because it is there to help you out, no matter where your day takes you, whether that be a crowded shopping mall, busy city street, or bumpy nature trail. The Cruz has plenty to offer, with a sturdy aluminum frame that offers strength without becoming unmanageably heavy. Carry all your essential baby products and your groceries in the large storage compartments (second only to the UPPAbaby Vista) while staying nimble and maneuverable. Your little one will be comfortable in the adjustable seat, which can be set to a number of positions, and which is easily removable for storage or to add a car seat. As a parent, you may sacrifice for your child, but with the Cruz, you don’t have to sacrifice for your stroller. The Cruz is an impressive stroller that stands out in the crowd. This stroller has a high for ease of use and is relatively light and small for what it has to offer. It has a sleek aluminum alloy frame that doesn't flex under pressure. The adjustable seat has a variety of possible positions and removes in a snap without a struggle for storage or adding a car seat. It features one of the only adjustable leg/foot rest in the group and has a maximum allowable storage capacity that is second only to the UPPAbaby Vista, its big brother. Brakes: The Cruz has single action brakes that are sandal foot friendly and easy to set and release. The brake is one giant red pedal in the center of the back side of the frame near the storage bin and is easy to access. Storage: This stroller has one of the largest storage bins with one of the highest allowable weight capacities at 25 pounds. The bin is extra-large and easy access on all sides including the front (a rarity). It can fit extra large diaper bag inside with no problem, and it didn't matter what position the seat was in. Sunshade: The Cruz's sunshade is impressive in size and quality with SPF +50 and kick-out sun visor for extra protection. It offers additional ventilation when fully open and it has a large peek-a-boo window made of mesh that is easy to see through. Harness: The 5-point harness is easy peasy to put on, take off, and to adjust and change shoulder height and crotch strap positions. The adjustable crotch strap increases the chances that you can get a good fit. The two side straps pop as they click in the buckle, so you know they are in, and while the release button can be a little stiff, the parts come apart easily. It offers a non-rethread harness adjustment with a unique hook system that is easy to use once you know how. Seat: The Cruz has an adjustable leg/foot rest, which is adjustable in several positions, and the footrest is wide but shallow. The footrest is made of plastic, and easy to clean.The seat back recline is another shining feature. It is easy to use with a push button operation that works with one hand. The Cruz works with the UPPAbaby Mesa car seat and uses the toddler seat attachment points on the stroller frame, so there are no adapters to misplace. The Mesa connects with a click in method and requires the toddler seat and canopy (they are connected) to be removed. It is easy to click in once you get both sides lined up properly, and feels stable. 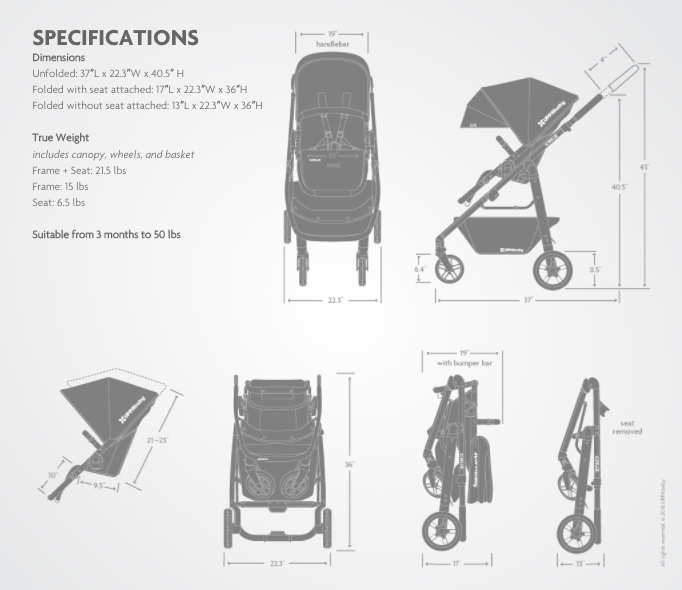 The frame weighs 14 pounds 14 ounces, which makes it a light-weight high-performance stroller. With the purchase of an adapter, the stroller is compatible with some Maxi-Cosi seats, Chicco options, the Nuna Pipa, and several Cybex options. The Chicco Keyfit 30 is one of the best choices among the other infant car seats, making it a nice budget-friendly option. However, after purchasing the adapter and the car seat, it comes closer to the price of the Mesa which fits on the frame without an adapter. The handlebar has a telescoping adjustment that prevents flex in the frame or handlebar. It has a nice range from 40.6 to 43.2 inches. The tubing is a nice size and shape and it is easy to grip. The bar is foam covered with the exception of the handle adjustment button that is hard plastic and the new updates include a leather wrapped handlebar that feels good in the hand. The fabric on the seat, basket, and canopy is a soft and tightly woven canvas that is nice to the touch and wipes clean relatively easily. The canvas reaches all the way down to the footrest that is made of smooth plastic. About Uppababy: UPPAbaby is a family run American company with more than a decade of experience in the juvenile product industry. They draw inspiration from daily family life and strive to create products that are easy to use, safe, and fun. UPPAbaby's goal is to improve products without sacrificing convenience, usability, or style. UPPAbaby also offers an infant car seat, the award winning UPPAbaby Mesa, and several stroller options that include lightweight, full-size, double, and umbrella options.